Niagara Frontier Plein Air Painters Exhibition - Carnegie Art Center - 249 Goundry Street, North Tonawanda, NY on Thursday Oct. 4, 2018 - 6:30pm to 8:30pm. The exhibition runs until Friday November 9, 2018. Buffalo Niagara Artist Association Exhibition at the Buffalo Arts Studio in the TriMain Building - 2495 Main Street, Buffalo - Reception and Awards is - Friday Oct. 26, 2018 from 5pm to 8pm. Fall exhibition runs until Nov. 3, 2018. Pastel Society of WNY Juried Exhibition in Rochester, NY at the Lavery Library , St. John Fisher College - Reception and Awards - Friday Oct. 19, 2018 - 6pm to 8pm - This exhibition runs until November 16, 2018. Special Event to help raise money for Art Programs at the Carnegie Art Center - 240 Goundry Street North Tonawanda, NY- Art Off the Wall - November 29, 2018 - from 6pm to 8:30pm. Jeannette submitted work for this event. Open to the public. Click on the link below to download and print the handout from the pastel demo on May 3, 2018. Jeannette Pikturna’s passion for art started at the age of 3. Jeannette started drawing at a very early age and it became very natural to her before she had any art instruction. Then in grammar school she joined art club and really loved it. In high school she studied Commercial Art and she was hooked. When she was ready for college she wanted to go into Fine Art and everyone encouraged her to go into Graphic Design. The term "Starving Artists" was used quite a bit and for survival purposes she studied Graphic Design and Computer Graphics as a plan B. Jeannette still took fine art classes as well in college, and her minor was photography. Along the way Jeannette learned marketing and business too during her career path. Jeannette has certifications in a few electronic media formats as well so she could stay in the growing creative world. Her expertise led her to become an Exhibitions Director for 4 yrs. at a not for profit art center in Lockport, NY. Jeannette Pikturna resigned and is pursuing her long life time dream of full time FINE ARTIST. She did a full 360 circle and for many years now she is doing what always wanted to do as a child, and what she is meant to do as a life long career. (Paint Professionally) Animals, Plein Air, Still Life etc. ​Most of the time you will see Jeannette with her camera taking photos, and using some of them for references for her next painting. You may find her in the studio painting a custom pet portrait, painting wildlife, teaching, painting Plein Air, or on the road bringing artistic services to others. She participates in workshops to increase her skill sets, and she offers workshops and demos. She enjoys exhibiting her own artwork, participating in artistic community events, and immersing herself in the arts in one or another. Jeannette is an award winner for her artwork in galleries in WNY, and placed and won an award in her first International Plein Air competition in Aug. 2018. Jeannette continues to sell her work in WNY and Chicago, and in parts of the country. She is originally from Chicago, however currently resides in Lockport, NY since 2009. Jeannette taught and used different mediums in the past, however pastel is her go to medium. 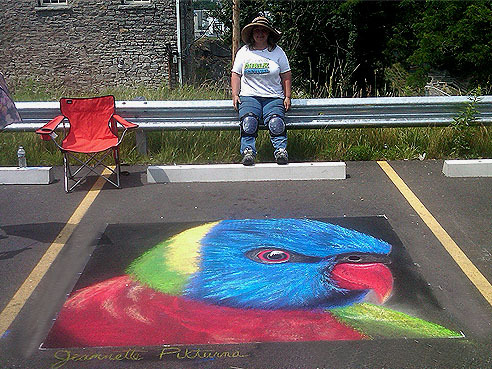 Jeannette is a full-time professional pastelist and her primary medium is pastel and she is known for her animal pastels and painting Plein Air - outdoors in the open air. Her painting style is unique varying between realism and expressionism. Jeannette’s primary inspiration comes from studying many famous artists within the art history classes in college, and her connection to animals and nature. She loves to express that connection with her interpretation on canvas, paper, velour and suede, other supports and for 4 yrs. on cement. 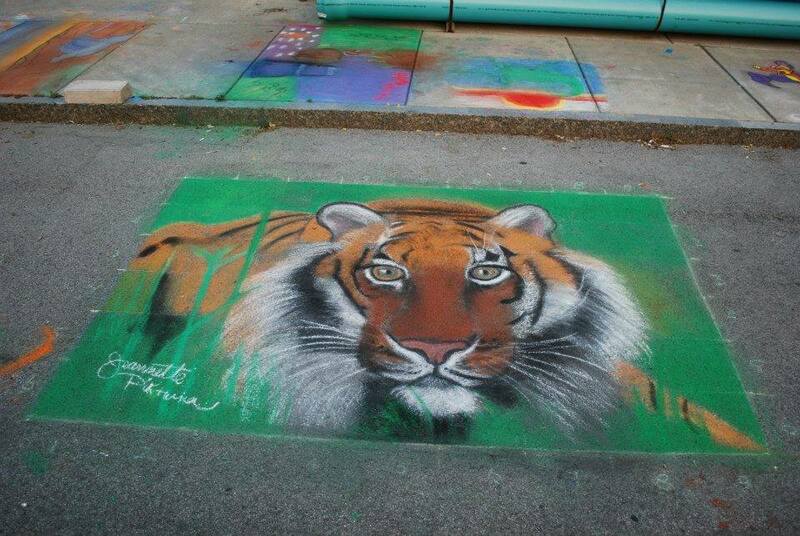 Jeannette created an 8’ humming bird in 2013, and a 6’x9’ tiger face made with pastels on the streets of Lockport NY for the SWEET CHALK FEST in Aug. 2014. This is the largest work she has created to date. She was a little nervous the first time because of the scale, and the rain factors however she over came those nerves and looks forward to doing it again and again! On July 11, and 12 of 2015 Jeannette created a 6'x7' love bird. 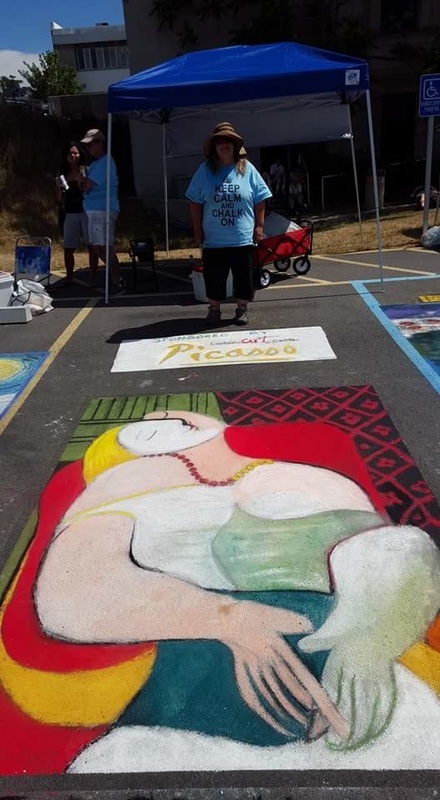 She participated in the SWEET CHALK FEST again with a group of artists from Lockport, NY and surrounding areas on July 16, and July 17, 2016. The theme was famous paintings so Jeannette painted a painting by PICASSO titled "THE DREAM" 8' high on the streets of Lockport, NY. Jeannette resigned from painting on the ground / hot asphalt in 2016. Lockside Art Center, Lockport NY sponsored Jeannette Pikturna in 2016 - Size 8' High - recreated PICASSO's PAINTING titled "THE DREAM" - theme FAMOUS PAINTINGS.